Though Japan’s troubled nuclear plants have hogged the spotlight of late, atomic power only provides about 20% of the Asian nation’s energy needs. 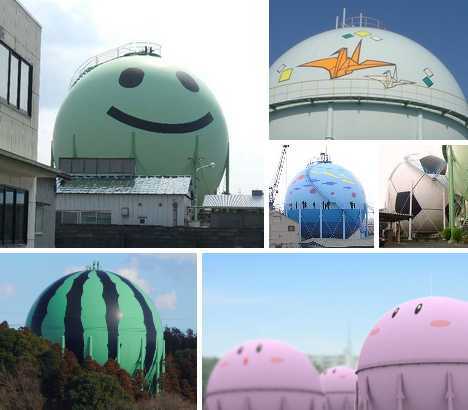 Petroleum products provide much of the rest, and the Japanese countryside is dotted with huge, spherical LNG storage tanks just crying out for a makeover. Artists have taken up the challenge, transforming otherwise bland and generic gas tanks into these bright and beautiful baubles. Is there anything in Japan that doesn’t sport a smiley face? The list is certainly short – and it just got shorter, thanks to the nice people at Shibata Gas. 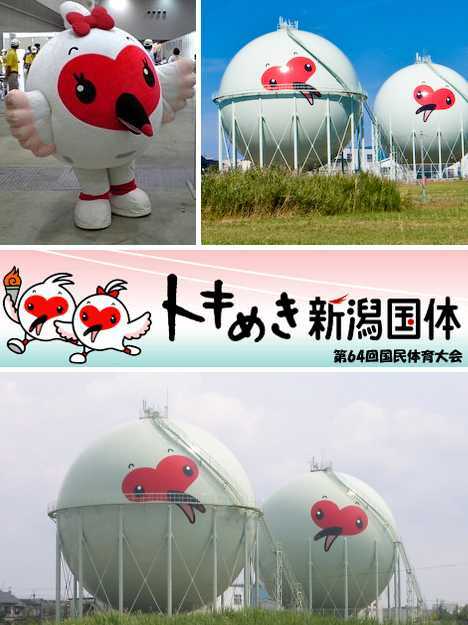 Like so many Japanese companies, Shibata Gas shows a friendly face to the public by employing a mascot, in this case “Nicotan”. 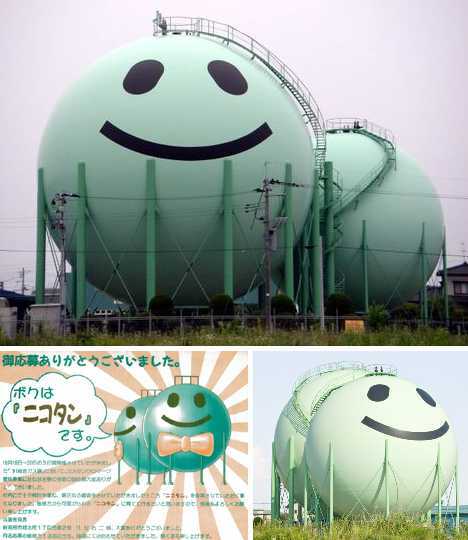 That’s Nicotan’s blissful visage above, gazing out from the side of a gas storage tank in Japan’s Niigata prefecture, in the country’s northeast. Above top is another Nicotan gas storage tank, this one located alone in a more urban setting nuzzling up to an equally friendly Eco Station. Would a Nicotan tank appear so peaceful and reassuring if, say, there were an accidental explosion of some sort? Let’s not go there. 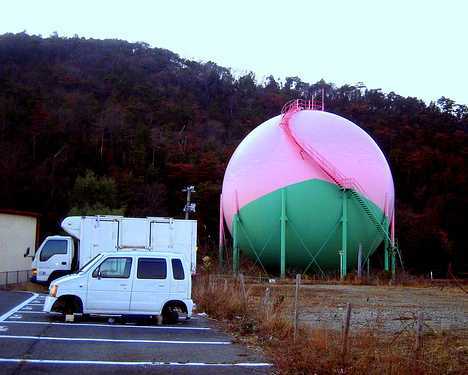 Instead, we’ll wonder how this enormous gas tank would look covered in cozy, cuddly plush fabric. 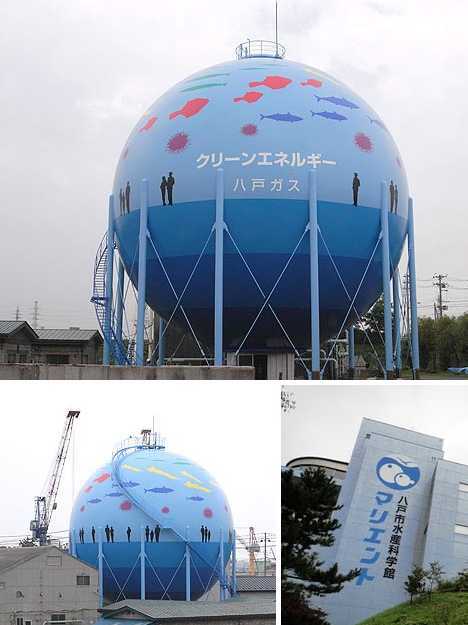 Sometimes Japanese gas companies will decorate their storage tanks for a specific reason, usually promotion-related, but many of the decorated tanks seem to state no particular message. How to interpret the simple eyes & mouth on the mint green gas tank at above left, or the childlike tandem bicycle procession rendered in fresh primary colors? 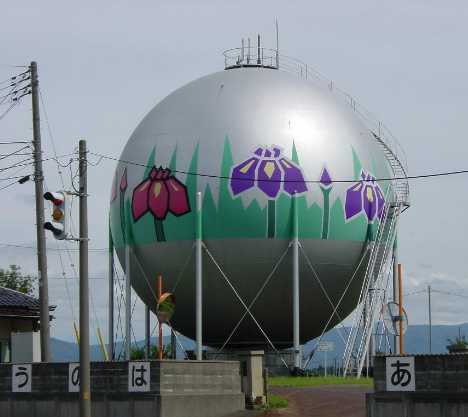 Here’s a rather large gas storage tank beautified by the addition of Japanese Irises encircling its midsection. One can’t argue the fact that what was once a drab, dreary industrial landscape has been enlivened by the illusion of a lush, colorful, virtual flower garden. Everyone loves melons, amiright? And when it comes to melons, bigger is better, agreed? 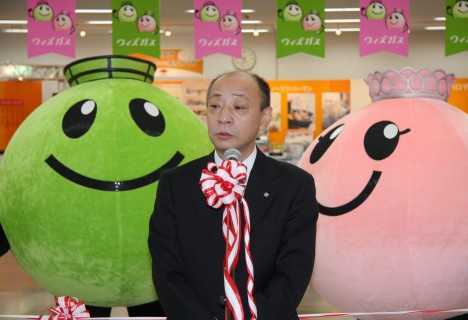 If you’re with me so far, then you’re gonna love the larger than life melon that is the pride of Tomisato in Chiba prefecture east of Tokyo. 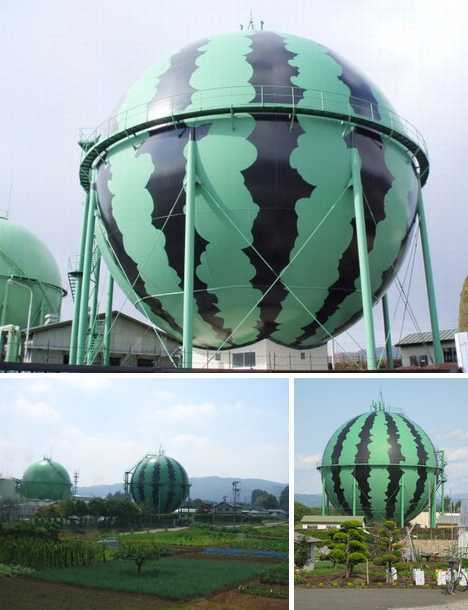 Tomisato City is the second largest watermelon producing district in Japan, which explains the sweet paint job sported by a gas tank at Park No. 2 of the Tomisato Second Industrial Complex. 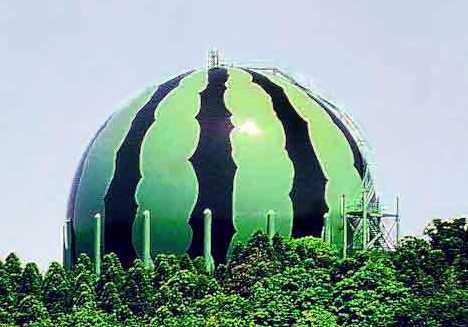 Where there’s one melon, you’ll probably find another: this one’s located in Takizawa, Iwate prefecture in northern Honshu. Takizawa’s claim to fame is that it’s the “largest village in Japan” with a population of just under 53,000 (2003). 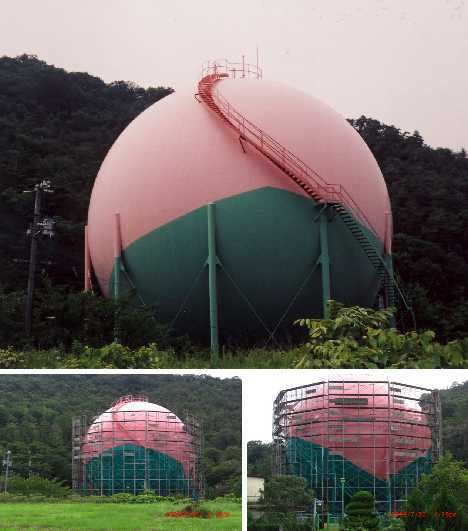 Like Tomisato, Takizawa is known for its summer watermelons and that presumably includes this enormous painted gas storage tank. Gas storage tanks can be found all over the world but someone suddenly confronted by this pair of tanks won’t have much trouble discerning where they are. 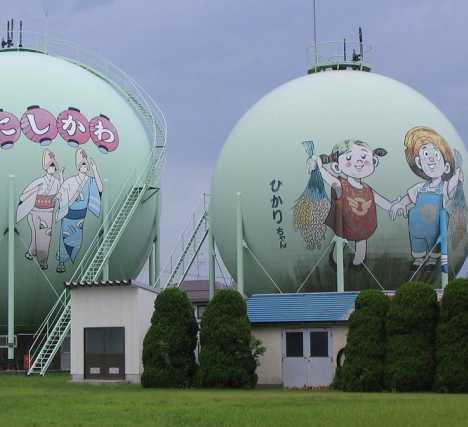 Folk tales, legends and historical themes are popular subjects for gas tank art in Japan, and the above rendering of Hikari-chan and Gatto-kun on the tank at above right is a prime example. 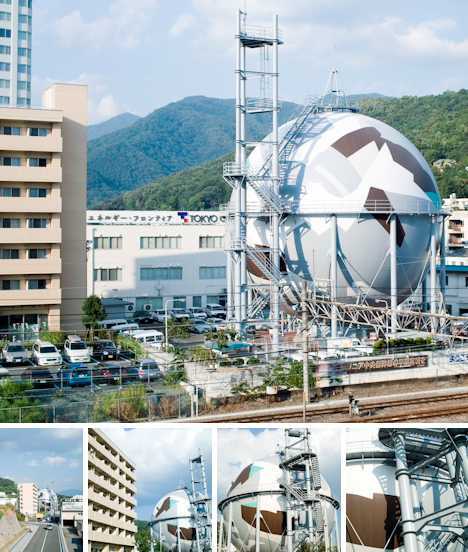 The giant soccer ball above hails from the city of Kiryu in Gunma prefecture. 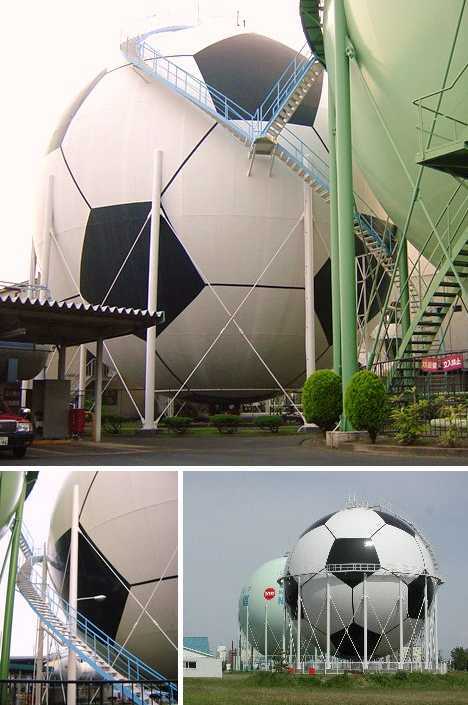 The owner of the tank, Kiryu Gas, ordered the distinctive black & white paint job as a tribute to the 2002 FIFA World Cup hosted by Japan and Korea. Note the meticulous landscaping around – and even under – the huge tank. 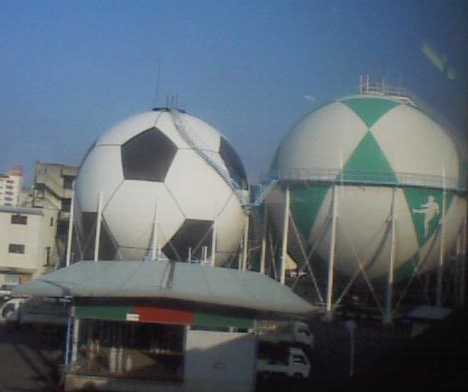 Were those twisted trees trimmed to look like bonsai, adding to the illusion of a gas storage tank as a soccer ball? Back to Niigata, a city that seems to host more than its fair share of decorated gas tanks – not that there’s anything wrong with that. The matching pair above feature Tokkikki, an official prefectural mascot based on the Japanese Ibis. Does This Tank Make Me Look Fat? 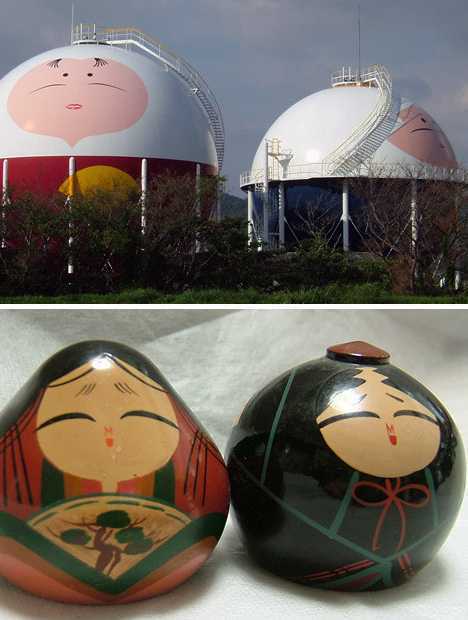 This pair of gas storage tanks can be found in Yamaguchi, in southwestern Japan on the island of Kyushu. 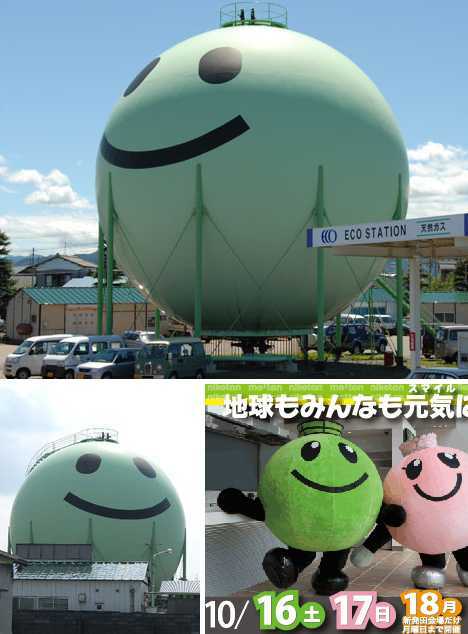 Each tank features the chubby-cheeked countenance of an Ouchi doll, one of Yamaguchi’s traditional handicrafts. 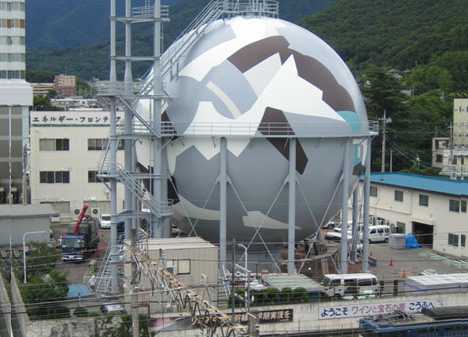 In 1997, Tokyo Gas company decided their 21-meter diameter, 5,000 cubic meter capacity gas storage tank in the city of Kofu could do with some freshening up. The result resembles the jagged “Dazzle” camouflage used on warships in the early part of the 20th century. Kofu’s “dazzle tank” employs contrasting yet subdued hues meant to symbolize the roof tiles and plastered stone walls of the former Maizuru Castle, where legendary warlord Takeda Shingen ruled over 400 years ago. Sometimes you want to blend in, sometimes you don’t. This is a prime example of the latter. 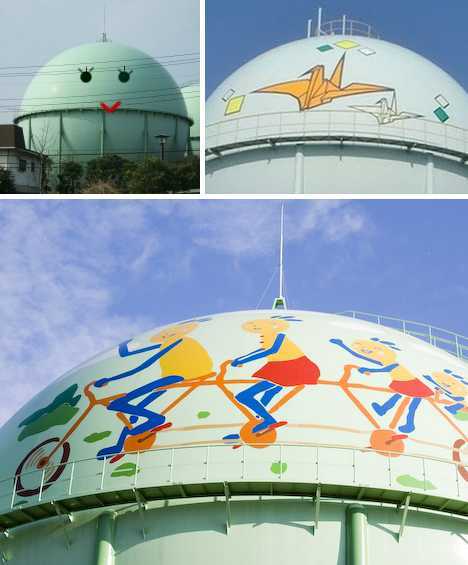 In the spring of 2009, Okayama Gas commissioned a renewal project for their gas storage tank located outside the city of Akaiwa. By July the temporary scaffolding was taken down and the result… let’s just say it looks peachy. 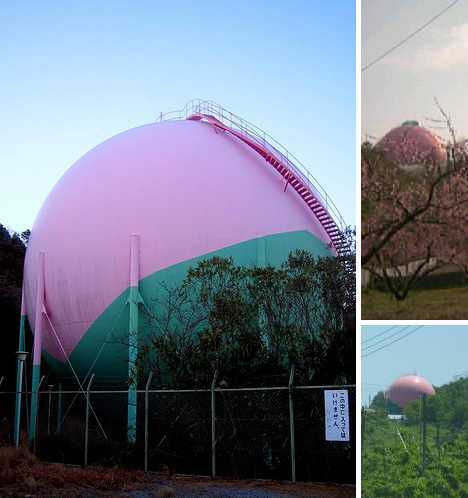 Akaiwa sits smack dab in peach country, so much like Tomisato’s Big Watermelon, the Okayama Gas storage tank does double duty by advertising the area’s most important cash crop. Are you listening, Georgia? 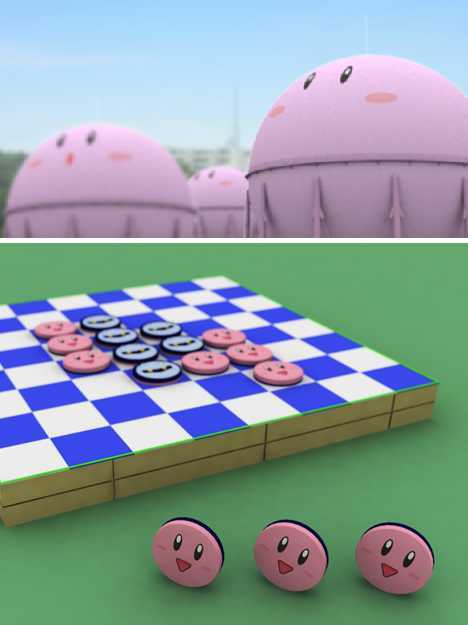 A Nintendo Kirby gas tank farm? In my prefecture? It’s more likely than you think… well, maybe not. This pink petro-paradise is merely a design study but hey, why not? If energy utilities want to soften their image, all it would take is a little imagination… and a LOT of pink paint. Never mind a mine shaft gap, is anyone worried about an artistic gas storage tank gap? 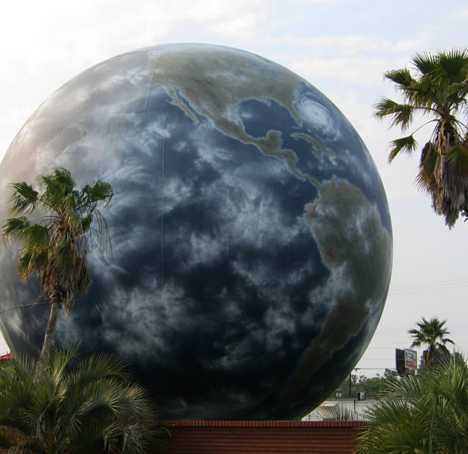 It’s not as if the USA isn’t trying – just take The Savannah Globe, or World Globe Gas Storage Tank as it’s sometimes called. This tank has been showing off its down-to-earth exterior since the late 1950s but the most recent renovation in the year 2000 puts it light years ahead of any other tank. The detail is amazing, approximating images beamed back from orbiting satellites. You can even see a hurricane bearing down on Savannah… uh oh.